If you are looking for the best police flashlight, please search through our articles here. Oh, and there are many more reviews on the way, too. Bringing light to the party is an important thing for officer safety when you are working the street. A cop making a traffic stop or going on an alarm call during night time hours runs the risk of encountering a violent criminal. A good flashlight can help keep that police officer safe. Blackhawk Legacy L-6V Flashlight Review – A SWAT cop takes the L-6V flashlight on patrol and has the good and bad on this light. It is a thumbs up, but there are some quirks you need to know before buying. Blinded by the Light: Sightmark H2000 Review – Can you believe 2000 lumens in a handheld flashlight? Oh yeah. Plus the kit comes with an easy way to mount it to your AR or other long gun if you like. Total price is very reasonable also, which is important on a law enforcement budget. Cyclops Universal Flashlight Holder Review – Aaron takes a look at this unique, “one size fits most” flashlight holder. Fenix L2D Tactical Flashlight Review – Inexpensive doesn’t have to mean cheap, and the L2D proves it. This small light packs a lot of punch for the price. Fenix TK40 Flashlight Review – Zombie Killer is the best term given to the TK40 series of flashlights. It is nearly bright enough to strip flesh from the living dead. But how it is for law enforcement work? Sightmark H2000 Flashlight Review – This rechargeable flashlight throws a whopping 2000 lumens and retails for less than $200. 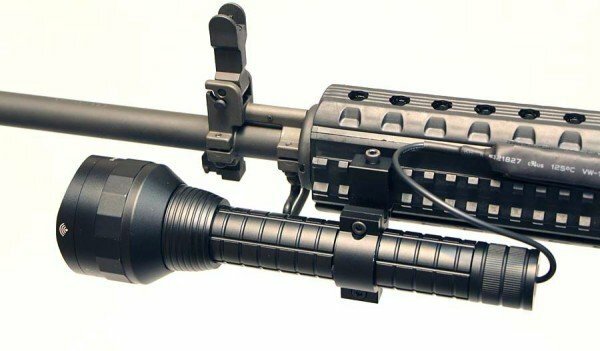 It even comes with a remote switch and mounting hardware to easily add it to your AR15. But is it the bargain it seems to be? Smith & Wesson Micro 90 Pistol Light Review – The Micro90 is an affordable pistol light that can mount on even compact handguns. We take a look at it. Streamlight Night Com UV Flashlight Review – If you ever had a need for a portable UV light, be sure to check out this product. It combines a white light with UV lights, allowing a police officer to check for counterfeit money, IDs and evidence. Streamlight PolyStinger LED Flashlight Review – The LED versions of the Streamlight flashlights are incredibly bright and rugged. The PolyStinger LED is one such example. Streamlight ProTac HL Review – An incredible high power LED flashlight that is pumping out 600 lumens of bright white light. This light is small enough to ride on your duty belt or in your cargo pocket, yet pumps out some unreal amounts of light. This is one of the very best police flashlights on the market today. Streamlight SL-20L Review – This flashlight is now part of my normal gear load when I am at work. Watch the video here and I will explain why. 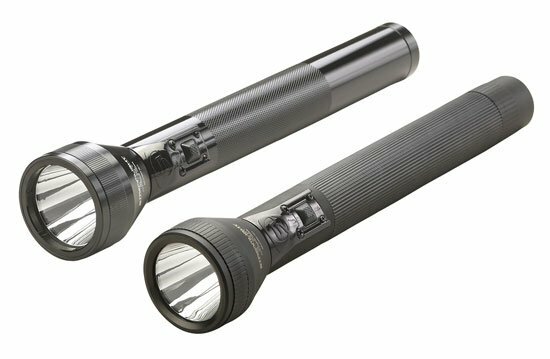 Streamlight Stinger DS LED HP Review – Nearly as powerful as the SL-20L, this flashlight is a fraction the size and still reasonably priced. An excellent choice, but with a potential drawback. Streamlight Strion Flashlight Review – Using old-school incandescent technology, the Strion is a nice choice as a backup torch on your duty belt, or as a off-duty light. TerraLux LED Review – Have an old flashlight that you wished you could upgrade to modern LED technology? TerraLux lets you do just that. We hope these police flashlight reviews are helpful. Please let us know what else you would like to see us test.